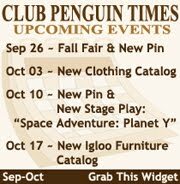 Updating Club Penguin Infos on Your Site Again! These Widgets are Updated at 4-7am cptz! It will automatically update for You! Choose the RIGHT SIZE for YOUR SIDEBAR. 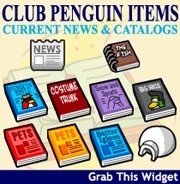 <p align="center"><a href="http://ladymaryann49.googlepages.com/grabmyclubpenguinwidgets"><img usemap="#catalogs" alt="CPCrazy Current News &amp; Catalogs Widget" style="border: 0px solid ; width: 210px; height: 215px;" src="http://ladymaryann49.googlepages.com/CPCrazyCatalogs210.jpg"/></a></p><map id="catalogs" name="catalogs"><area shape="rect" coords="37,49,71,80" alt="CP Times" href="http://ladymaryann49.googlepages.com/CPCrazyCurrentNews.html" target="_new" title="CP Times"/><area shape="rect" coords="121,53,162,77" alt="The F.I.S.H" href="http://ladymaryann49.googlepages.com/CPCrazyCurrentFish.html" target="_new" title="The F.I.S.H"/><area shape="rect" coords="6,100,52,131" alt="Penguin Style" href="http://ladymaryann49.googlepages.com/CPCrazyCurrentClothing.html" target="_new" title="Penguin Style"/><area shape="rect" coords="57,100,102,131" alt="Costume Trunk" href="http://ladymaryann49.googlepages.com/CPCrazyCurrentCostume.html" target="_new" title="Costume Trunk"/><area shape="rect" coords="105,100,152,131" alt="Snow & Sports" href="http://ladymaryann49.googlepages.com/CPCrazyCurrentSports.html" target="_new" title="Snow & Sports"/><area shape="rect" coords="156,100,201,131" alt="Big Wigs" href="http://ladymaryann49.googlepages.com/CPCrazyCurrentWigs.html" / target="_new" title="Big Wigs"/><area shape="rect" coords="6,154,56,186" alt="Adopt A Puffle" href="http://ladymaryann49.googlepages.com/CPCrazyCurrentPets.html" / target="_new" title="Adopt A Puffle"/><area shape="rect" coords="57,154,102,186" alt="Love Your Pets" href="http://ladymaryann49.googlepages.com/CPCrazyCurrentPetFurniture.html" target="_new" title="Love Your Pets"/><area shape="rect" coords="105,154,152,186" alt="Better Igloo" href="http://ladymaryann49.googlepages.com/CPCrazyCurrentIglooFurniture.html" target="_new" title="Better Igloo"/><area shape="rect" coords="170,154,201,186" alt="Igloo Upgrades"
<map id="catalogs" name="catalogs"><area shape="rect" coords="32,43,61,69" alt="CP Times"
href="http://ladymaryann49.googlepages.com/CPCrazyCurrentNews.html" target="_new" title="CP Times"/><area shape="rect" coords="108,43,139,66" alt="The F.I.S.H" href="http://ladymaryann49.googlepages.com/CPCrazyCurrentFish.html" target="_new" title="The F.I.S.H"/><area shape="rect" coords="5,87,46,114" alt="Penguin Style" href="http://ladymaryann49.googlepages.com/CPCrazyCurrentClothing.html" target="_new" title="Penguin Style"/><area shape="rect" coords="49,87,89,114" alt="Costume Trunk" href="http://ladymaryann49.googlepages.com/CPCrazyCurrentCostume.html" target="_new" title="Costume Trunk"/><area shape="rect" coords="91,87,133,114" alt="Snow & Sports" href="http://ladymaryann49.googlepages.com/CPCrazyCurrentSports.html" target="_new" title="Snow & Sports"/><area shape="rect" coords="134,87,174,114" alt="Big Wigs" href="http://ladymaryann49.googlepages.com/CPCrazyCurrentWigs.html" / target="_new" title="Big Wigs"/><area shape="rect" coords="6,131,46,159" alt="Adopt A Puffle" href="http://ladymaryann49.googlepages.com/CPCrazyCurrentPets.html" / target="_new" title="Adopt A Puffle"/><area shape="rect" coords="49,131,89,159" alt="Love Your Pets" href="http://ladymaryann49.googlepages.com/CPCrazyCurrentPetFurniture.html" target="_new" title="Love Your Pets"/><area shape="rect" coords="91,131,133,159" alt="Better Igloo" href="http://ladymaryann49.googlepages.com/CPCrazyCurrentIglooFurniture.html" target="_new" title="Better Igloo"/><area shape="rect" coords="148,129,171,151" alt="Igloo Upgrades" href="http://ladymaryann49.googlepages.com/CPCrazyCurrentIgloos.html" target="_new" title="Igloo Upgrades"/><area target-="_new" shape="rect" coords="1,172,80,183" alt="Club Penguin Crazy" href="http://club-penguin-crazy.blogspot.com" target="_new" title="Club Penguin Crazy"/><area shape="rect" coords="85,172,179,183" alt="Grab This Widget"